The project was born from my research on information flow and data visualisation. I was initially interested in the challenge of filtering and visualising real time information from networks like Twitter. I found interesting problems, like trusting the overwhelming amount of information available and its reliability, that could be approached with design thinking to propose adequate solutions. Eventually I found articles and research papers on the role social networks are having on emergency response. Most of information management problems were present on this area as well, so I focused my project to this area. 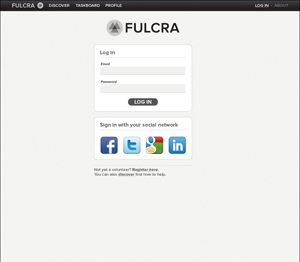 Fulcra is a digital platform, accessed through the web, for aid relief organizations to crowdsource menial tasks related to information. 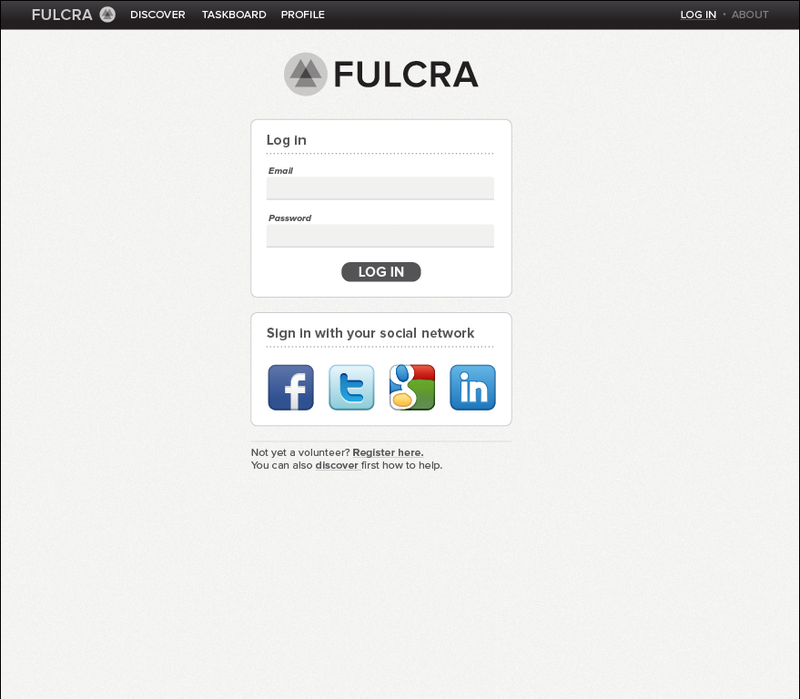 There is not a defined list of tasks that can be done with Fulcra but examples include searching and tagging images online, creating contextual reports, small translations of text or categorizing data to a community of online volunteers. In a more general sense it’s a platform for volunteers to assist the relief effort by compiling, analysing, aggregating, translating, categorizing, sharing, distributing and verifying information. 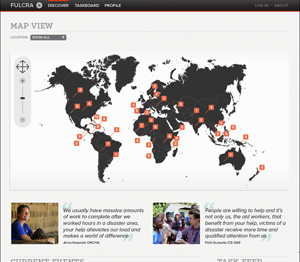 Fulcra allows aid workers to distribute small tasks to a community of volunteers. 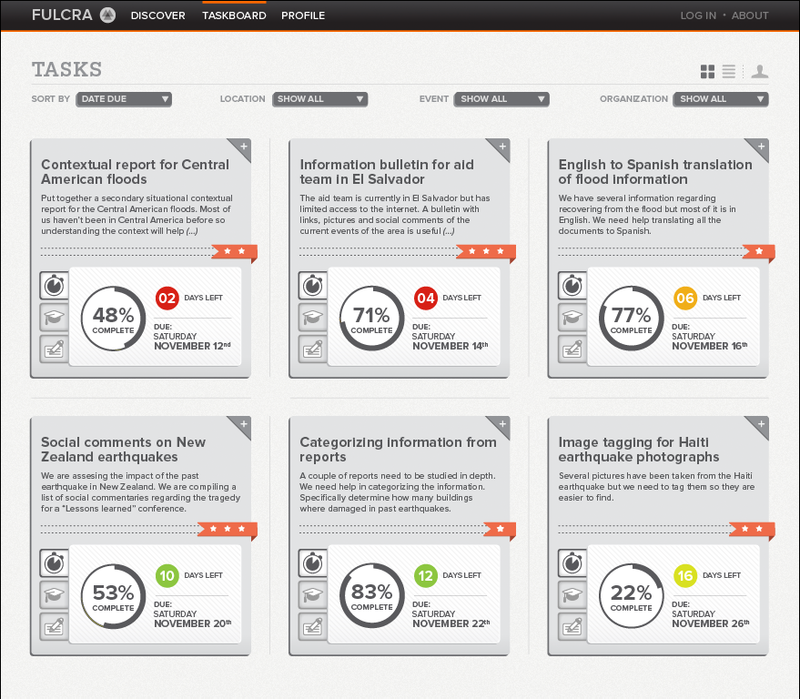 Each task is divided in four categories that regard information available online: links, tweets, images and notes. 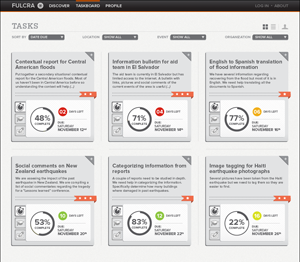 The volunteers receive the tasks and work on them by adding items available online relevant to each category. The community values the contributions by keeping those that are relevant and discarding those not so useful. When the task is completed the aid worker receives it. Taskboard: A digital board where the small and discrete tasks deployed by aid workers are searchable by volunteers; they use search and filter parameters to find tasks they feel they can do best. Discover: In the Discover section new users who are not sure where to begin can explore how they can help. 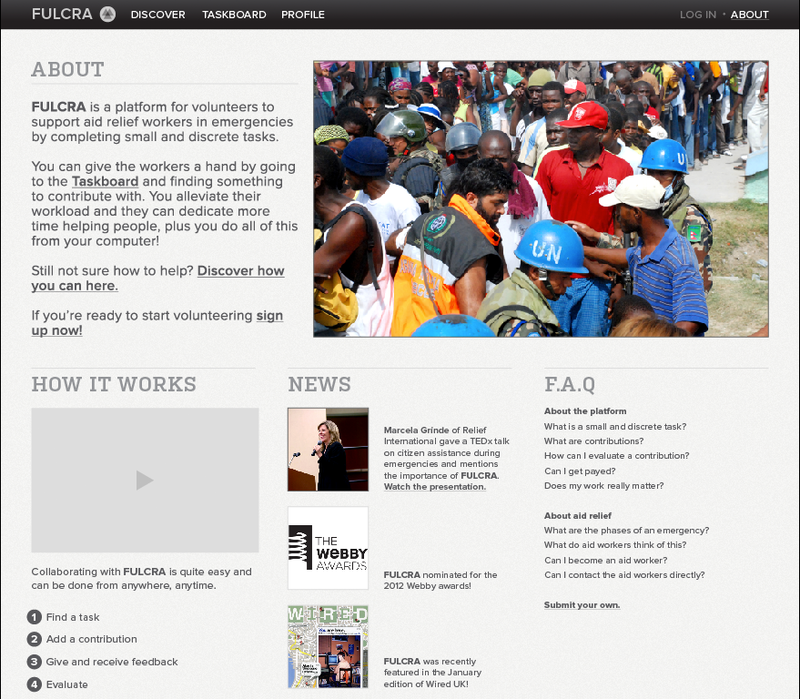 They can explore tasks by location, by event, and by organizations or by participating volunteers. 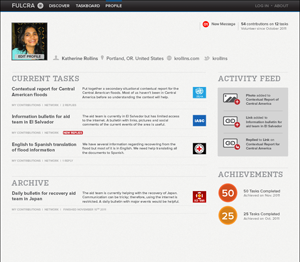 Profile: Users and organizations control their work here. Sign in: For registration and log in. 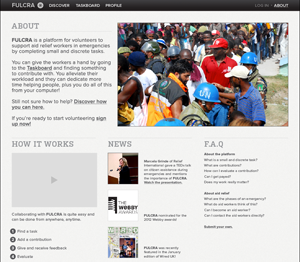 About: The About section quickly describes what the platform is about and how it works. 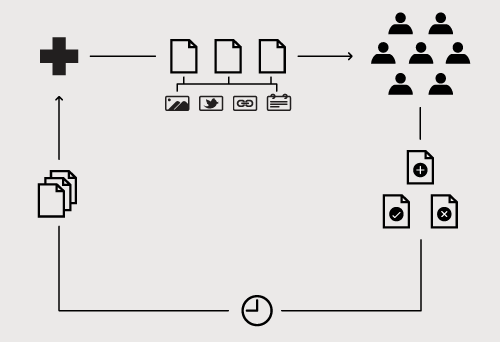 The following user scenarios and personas describe the likely uses of the platform. 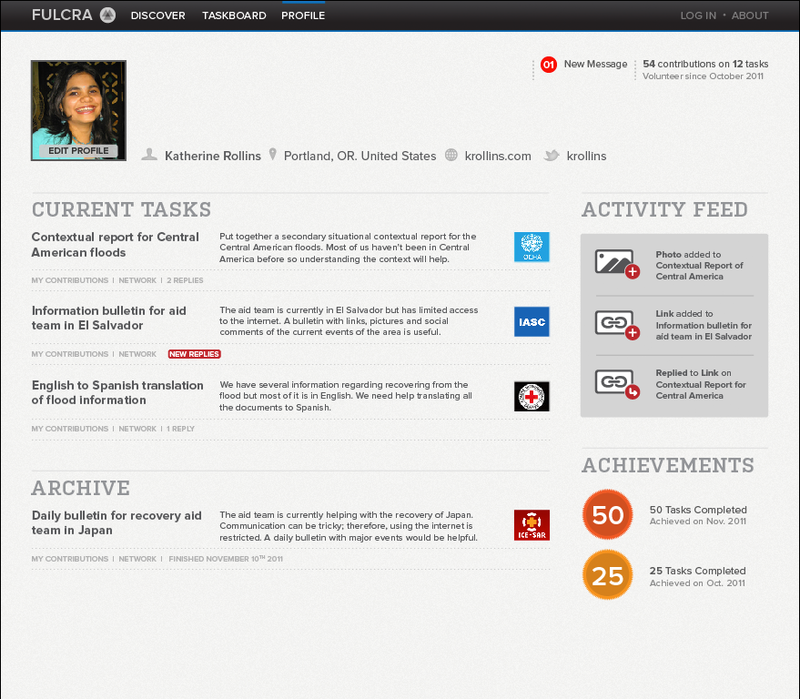 The scenario describes the main user, Joyce, who has been using Fulcra for sometime now. The characteristics of the main profile included feeling comfortable with new technologies and social media and using at least two of them daily: someone who can use the Internet as a tool for different purposes like activism. The second scenario describes the behaviour of the new user: Ryan. The characteristics of the secondary profile would be someone with enough experience to quickly pick up and learn about new online services and platforms: For example, someone from a generation who was never raised with the Internet or personal computers but can use Twitter or an iPhone without problems. 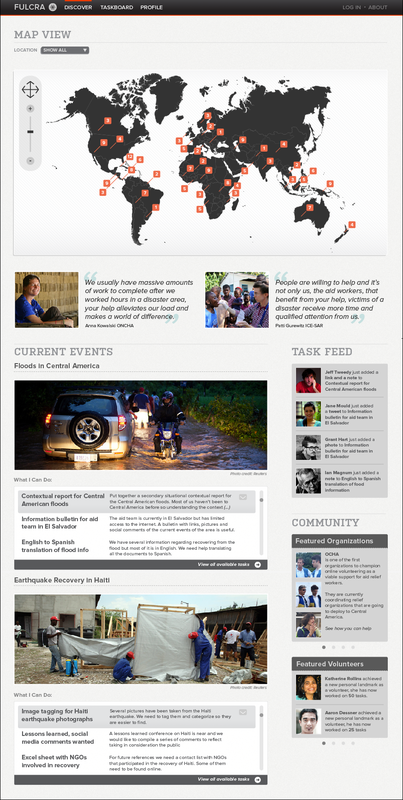 The third scenario describes the aid worker: Martin. The aid relief worker suitable for my platform believes the crowd is reliable, and will increase its role in emergencies; therefore, it’s better to include and guide them than marginalize them.